Smart Short Courses joins forces again with YABITED. We already had a successful cooperation in 2017; now we bring the technical short course back in a fully updated version. 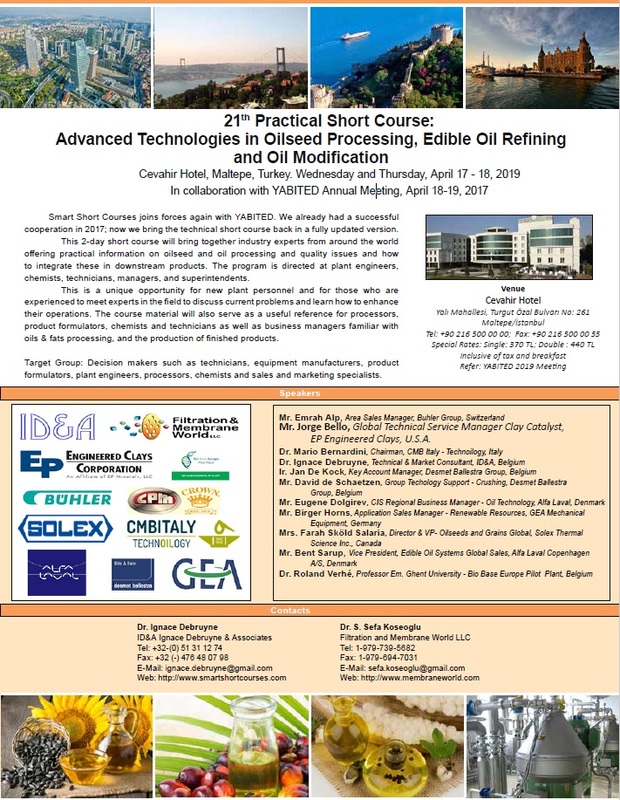 This 2-day short course will bring together industry experts from around the world offering practical information on oilseed and oil processing and quality issues and how to integrate these in downstream products. The program is directed at plant engineers, chemists, technicians, managers, and superintendents. Program participants get free access to the oils + fats Trade show during breaks and mid-afternoon at the end of the daily technical program. This is a unique opportunity for new plant personnel and for those who are experienced to meet experts in the field to discuss current problems and learn how to enhance their operations. The course material will also serve as a useful reference for processors, product formulators, chemists and technicians as well as business managers familiar with oils & fats processing, and the production of finished products.